It looks like choosing foods following the dietary pattern of the Mediterranean way of eating suggests a lower risk of men developing aggressive prostate cancer according to recent research.The study, which was conducted in 7 Spanish provinces in Spain, followed 754 men with confirmed incident cases of prostate cancer and 1,277 controls aged 38 to 85 between September 2008 and December 2013. 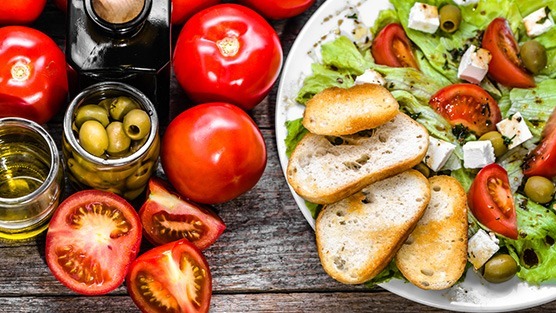 The researchers found that men who followed the dietary patterns of the Mediterranean diet had a lower risk of aggressive prostate cancer than men who followed either a Prudent or Western diet. This population-based multicase-control study looked at the association between the dietary patterns of the Western, Prudent, and Mediterranean that were reconstructed using MCC-Spain data. To assess the association between each dietary way of eating and the risk of prostate cancer, logistic regression models with random province-specific intercepts were used. Researchers looked at risk of aggressive prostate tumors according to a Gleason score grade of 6 vs >6. A Prudent diet in the study was defined as a dietary pattern of high consumption of low fat dairy foods, vegetables, fruits, whole grains and juices. The definition of a Western pattern of eating is loosely considered one high in saturated fats, red meat, refined and processed foods while low in consumption of fruits, vegetables, whole grains, and seafood.